As Mark Twain, Samuel Clemens straddled the conflicts between culture and commerce that characterized the era he named the Gilded Age. In "e;Littery Man"e;, Richard Lowry examines how Twain used these conflicts in his major texts to fashion an "e;autobiography of authorship,"e; a narrative of his own claims to literary authority at that moment when the American Writer emerged as a … profession. Drawing on wide range of cultural genres--popular boys' fiction, childbearing manuals, travel narratives, autobiography, and criticism and fiction of the period--Lowry reconstructs how Twain participated in remaking the "e;literary"e; into a powerful social category of representation. 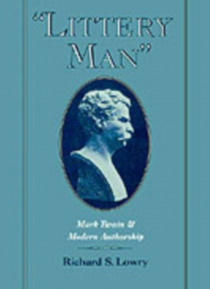 He shows how, as one of our cultures first modern celebrities, Samuel Clemens transformed his life into the artful performance we have come to know as Mark Twain, and his texts into a searching critique of modern identity in a mass-mediated society. "e;Littery Man"e; will appeal to both Twain scholars and to scholars and students of nineteenth-century American literature and culture.